At midnight on 4 August I looked out of my hotel room and saw a crowd of jubilant people ushering the Olympic flame down Ipanema beach. There was a party mood, no protests, just joy that the Olympics really had come to Rio. That is what the Olympics should bring: joy. And for the following fortnight there were many joyful moments for athletes and sports fans alike. But there was also despair about corruption allegations in boxing, arrests of senior Olympic officials, doping in many sports and bad behaviour by US swimmers. I have been involved in sports my entire life. I played cricket for the West Indies for 17 years and experienced the highs of great sporting achievement as we were considered the best team in the world during that time. To me, integrity and sport must go hand in hand. Too often, however, that is not the case. I was in Rio to present recommendations from Transparency International’s Global Corruption Report: Sport at the 8th Commonwealth Sports Ministers Meeting to the sports ministers from around the 54 Commonwealth group of nations. My message focused on action. Organisations and athletes can sign up to codes of conduct and integrity in sport principles and governments can sign up to declarations with good intentions, but unless organisations are held to account, nothing will change. Though the primary objective of the meeting was to advance consensus and co-operation on key sport policy issues, Transparency International insisted that sport is not simply a business or a government department: it is a public good. But to maintain integrity in sport, it will take actions by all those who have a stake, including governments. There are two key ways to fight corruption in sport: one is deepening transparency and open data, particularly around financial information. The second is making sure those who bring sport into disrepute are held to account. How this is done is still inconsistent because of a lack of standardisation on both criminal and sporting sanctions. Too often sports organisations are seen as closed shops, where those part of the (mostly) old boys’ network can act with impunity. It took decades and dawn raids initiated by the US Department of Justice to blow the lid off FIFA, world football’s governing body and a French police action to nab the head of the track and field boss for bribery and corruption. 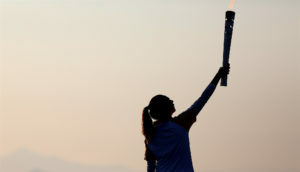 As the closing ceremony of the Olympics extinguishes the Rio flame, I hope we can be optimistic that between now and the 2020 Olympic games in Tokyo the headlines will all be about the joy of sport on the field and not about corruption on and off it.